These heavy duty exhaust valve springs are required if you plan on running any exhaust brake or higher than stock rpm and or higher boost. Completely safe spring pressures, even for stock running components. 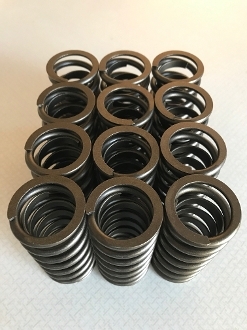 If you have a mechanical 6bt 5.9L and are going to install an exhaust brake or turn higher than normal rpm or run higher boost than stock, you don't have strong enough valve springs to effectively hold the valves close.